Most days for lunch I look for a way to layer my ingredients: veggies with greens and protein. I typically eat more raw foods at lunch than in the evening because I move around more throughout the rest of the day which helps aid in digestion, whereas in the evening, lightly steaming or cooking the vegetables makes it easier to break them down. I absolutely love the organic broccoli slaw packages. It comes already shredded as a combination of broccoli, cabbage and carrots. I use it as a salad base, to fill egg crepes or to mix into stir-frys. 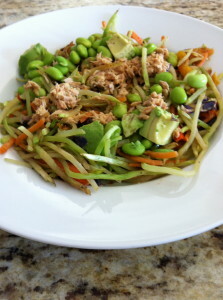 Today I made a simple tuna broccoli slaw that is super easy and very filling. What's your favorite way to get in veggies at lunch?